Several hundred people showed up for the funeral of Osaze Osagie at State College Alliance Church. 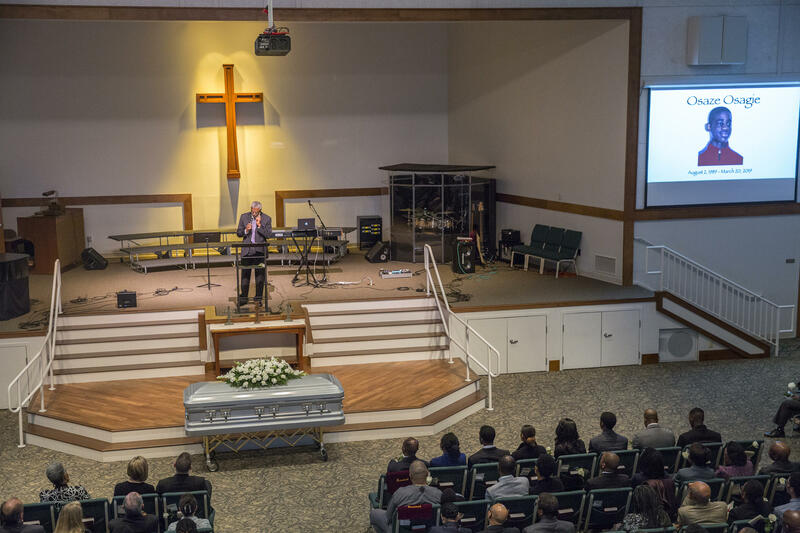 Speakers at the funeral of Osaze Osagie talked about his smile, his hugs and his deep faith in God. Several hundred people attended the funeral on Saturday of the 29-year-old black man shot by State College police on March 20. Attendees were given a white rose as they entered State College Alliance Church. Attendees at the funeral of Osaze Osagie were given a white rose when they arrived at the church. The crowd filled the 500-seat worship space and more than 100 people watched the service through a video feed in the lobby of the church. A band sang worship hymns. Pastor Harold McKenzie from Unity Church of Jesus Christ in State College read a statement from Osagie's parents, Sylvester and Iyun Osagie. Osagie was autistic. He was shot by State College police who came to his apartment for a mental health check, requested by his father. Osagie reportedly confronted police with a knife. The shooting is the first known fatal police shooting by State College Borough Police. McKenzie said the community is hurting, frustrated and asking questions. 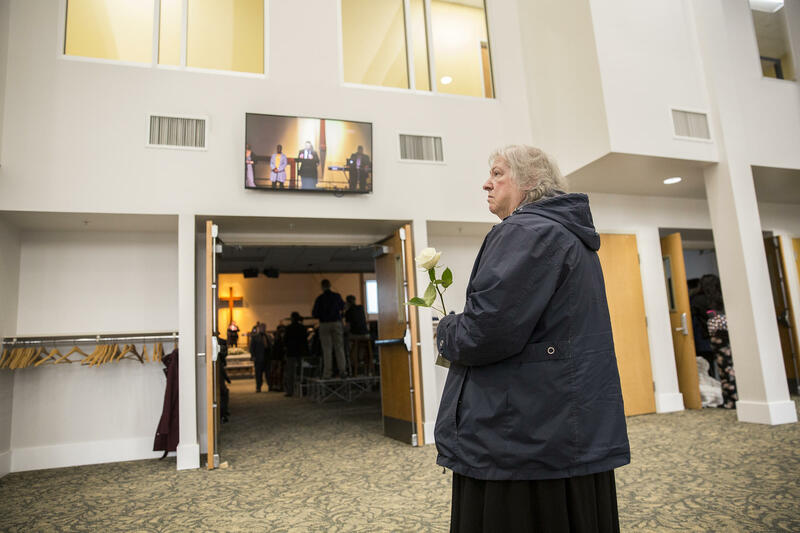 The funeral crowd overflowed into the church lobby, where people watched on a video feed. The family’s pastor, Zac McDonald, from State College Access Church, said he’d know the Osagie family since he was in middle school. He shared the last text Osagie sent to his mother. Osagie was buried after the funeral service at Pine Hall Cemetery in State College. Attorney Andrew Shubin says the parents of Osaze Osagie feel enormous grief, as any parent would if they lost their son. “But, in this situation, it’s far more complicated and really devastating," Shubin said. "You have a parent who reached out for help, who set the wheels in motion for what eventually wound up as a police shooting of their son." When the State College group Community and Campus in Unity met Monday night, the focus was on the fatal shooting of Osaze Osagie and rebuilding community trust. Several hundred people gathered for a vigil at the Allen Street Gates in State College Thursday evening for the man who was fatally shot by police Wednesday. 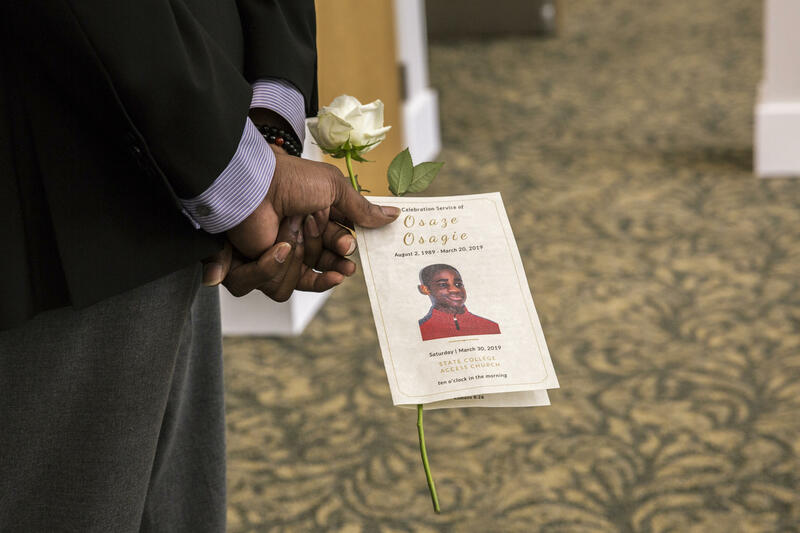 “We are gathered here tonight to honor the life of 29-year-old Osaze Osagie,” said Danieltta Pantoe, a Penn State junior and president of the Student Black Caucus, as she led the vigil to remember Osagie. Osagie was fatally shot by State College police Wednesday. Police went to his apartment for a mental health check, and he reportedly confronted them with a knife.